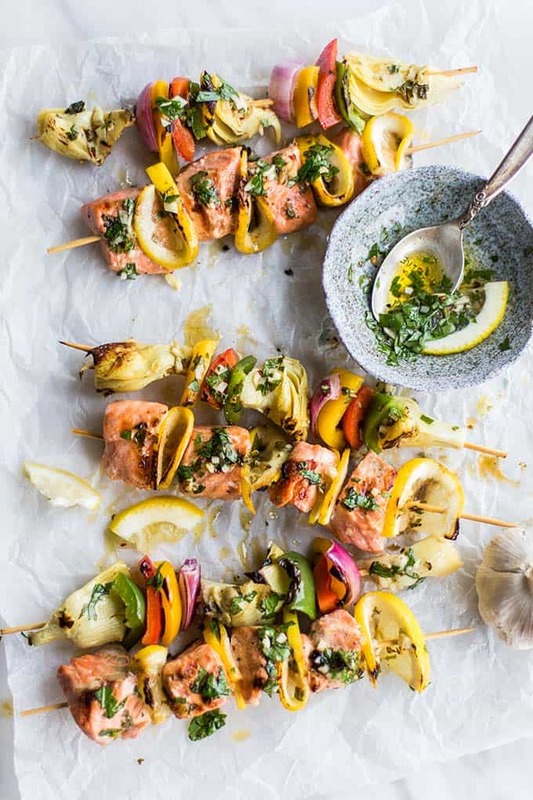 If you’re looking for a fun and healthy BBQ recipe this summer, these Mediterranean Salmon and Artichoke Skewers are just the thing! 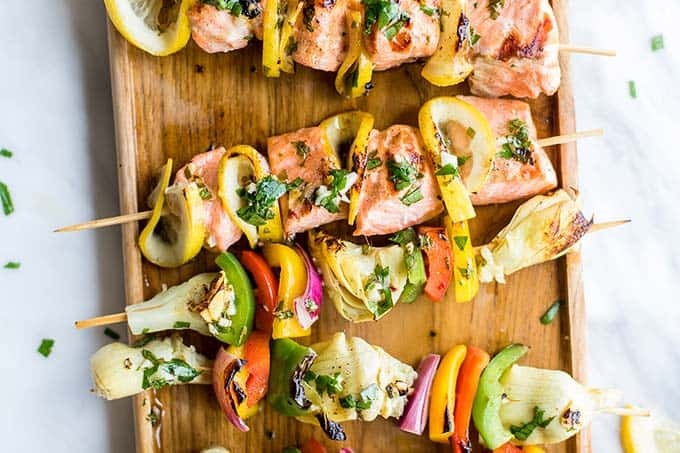 Salmon is skewered with thinly sliced lemons, and served with skewers of artichokes, peppers, and onions. 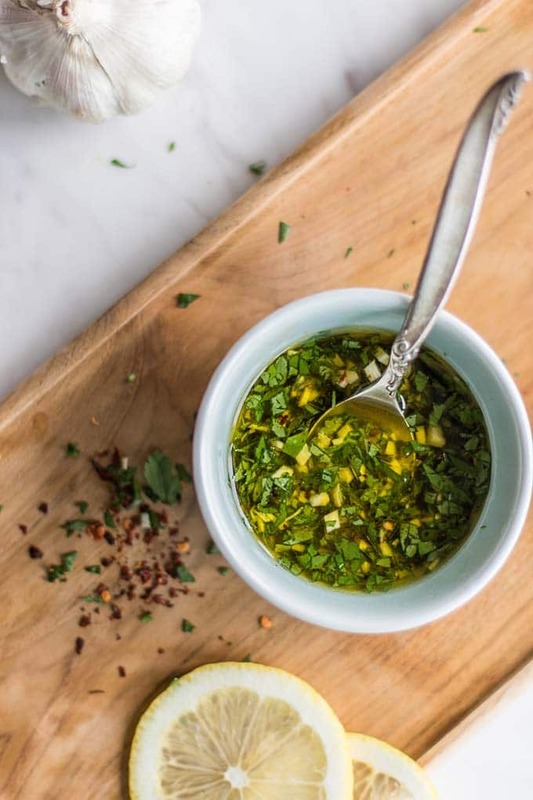 A simply parsley marinade adds flavor and keeps everything moist on the grill. This post is sponsored by Reese — a brand I have known and used for years. I only work with brands who’s products I genuinely love. Thank you for supporting the brands that help keep Sunkissed Kitchen running at full speed. Summer is officially here, and that means we are all in full grilling mode! I can’t wait to grill ALL THE THINGS once June arrives. Salmon is one of my favorite quick and easy meals, but grilling salmon can get messy. Wrapped up in a foil pouch, simply seasoned with sea salt, pepper, dill, and lemon slices. On a skewer, but using a simple olive oil marinade to keep them from sticking or drying out. 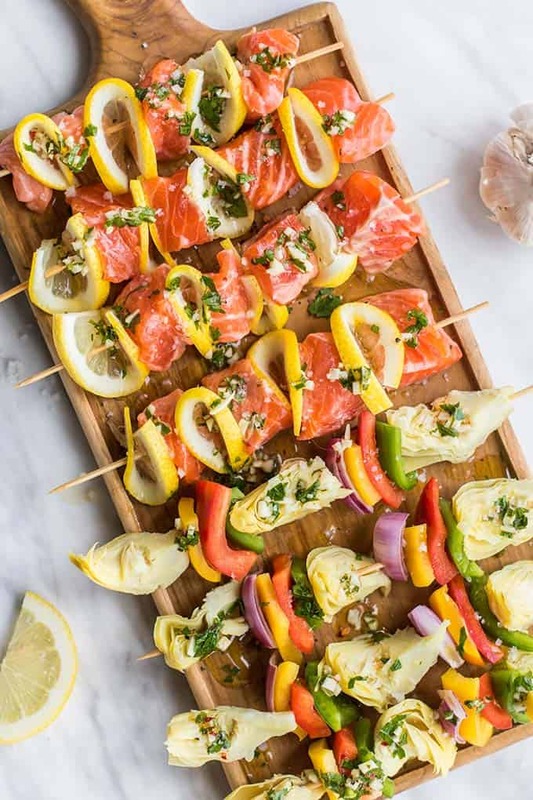 These Mediterranean Salmon and Artichoke Skewers dress up the second approach, and make them special enough to serve at any summer event – whether it’s a simple family dinner, or a large gathering, these salmon kebabs will be a big hit. The simple marinade I use for these is a combination of olive oil, lemon juice, a touch of white wine vinegar, lots of garlic and parsley, and a few pinches of chili. It takes about 5 minutes to prepare, and adds great flavor dimensions. Artichokes are great grilled, but they aren’t something I prepare often — whole artichokes are not super easy to serve, especially at gatherings! Artichoke hearts are the perfect way to enjoy them, and they make these salmon skewers extra special. We love how they elevate a simple salmon dinner, and I know you will too. These simple ingredients can be prepared in about 10 minutes, and they take another 10-14 minutes to grill. Or swap the salmon for chicken or steak! I used Reese’s Marinated Artichoke Hearts in this recipe. I loved the extra layer of flavor they added, but using artichoke hearts canned in water would also work and would lower the overall calories in this dish. Artichoke hearts are actually very low in calories and carbs, even though they seem more filling than other low carb veggies. For me, this simple combination made a very satisfying low carb meal. If you’d like to make this meal more family-friendly, serve it over rice or quinoa, or with a side of potatoes. Summer meals should be simple and easy to prepare. We all want to be spending time playing outside and enjoying the company of our families, not slaving away in the kitchen! Reese artichoke hearts are such a simple way to make ordinary skewers extra special. And — Reese is hosting A GIVEAWAY! Enter to win a Kitchenaide Mixer, a $100 gift card to the grocer of your choice, and a Reese product pack! Reese’s wants to encourage everyone to Step Out of Your Comfort Food, and try some new delicious recipes this summer! 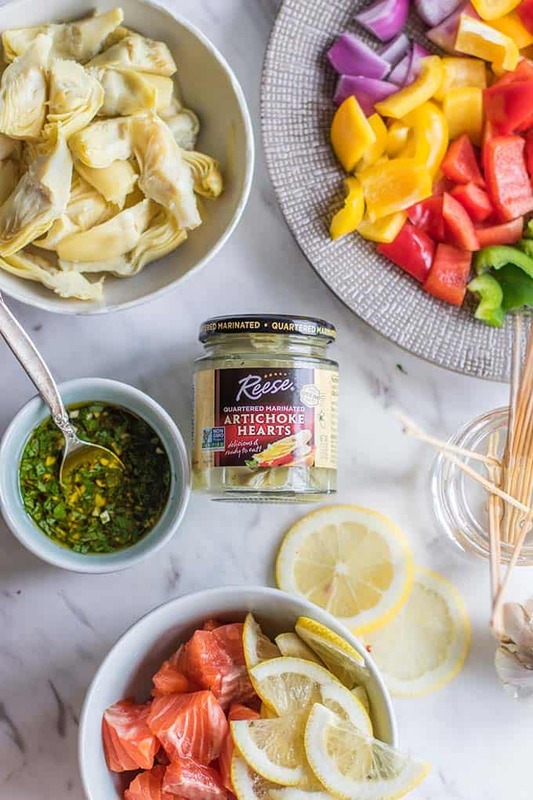 If you try a new recipe using artichoke hearts, tag Reese’s (IG & FB: @ReeseSpecialityFoods) #StepOutofYourComfortFood, and your dish might be featured on their social media pages! Make them Whole30: This recipe as written is a perfect Whole30 grilling recipe. 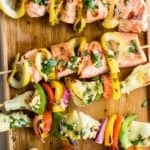 Make them for the Family: I find these salmon and artichoke skewers to be a very satisfying low carb meal on their own. To make them more family-friendly, serve them with rice or quinoa, or even some baked or grilled potatoes. These would be delicious served with my Summer Greek Quinoa Salad. Make Ahead: These skewers are fine made the day ahead. Prepare them, and then store them in an airtight container until you’re ready to grill. 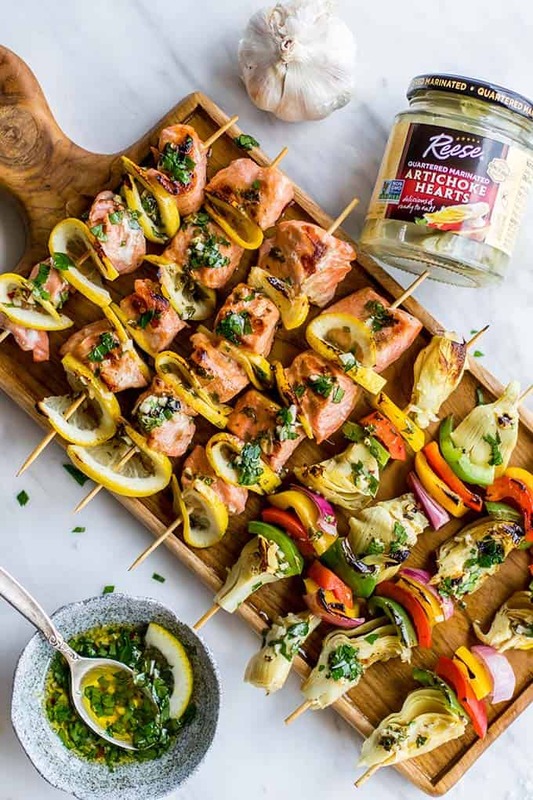 Mix up your summer BBQ by adding fiber rich artichoke hearts to your salmon skewers. This healthy mix of salmon and veggies are all easy to prepare and cook quickly, meaning you can have a really special dinner ready in no time. Drizzle these with a flavorful parsley olive oil sauce. Soak wooden skewers in water for at least an hour prior to using. Alternately, use metal skewers. Prepare the marinade by adding all the ingredients together in a small dish. Mix to combine, and set aside. Add the salmon to 4 skewers, alternating salmon and thinly sliced pieces of lemon. Drizzle with 1/4 of the parsley marinade. The marinade can simply be spooned on, or you can use a brush to more evenly coat the skewers. Add the artichoke hearts, peppers, and onions to 4 skewers, and drizzle with 1/4 of the parsley marinade, reserving 1/2 of the marinade to add to the finished dish. Over a very hot grill, cook the skewers for 4-6 minutes. slip, and cook the other side until the salmon is cooked throughout and veggies are done to preferred doneness. Serve the skewers with the remaining parsley sauce. This Mediterranean Salmon and Artichoke Skewers post may contain affiliate links, meaning if you make a purchase, I will receive part of the sale as a comission. This helps me continue to bring you lots of fresh and inspired recipes! Wow! How gorgeous do these skewers look! My husband LOVES artichokes, so I am saving this recipe. My husband does too-- and so did my dad. Maybe it's a man thing? I love them too, but maybe not as much as they claim to! Could these be cooked in the oven? Time and temp? Hi! They absolutely can be cooked in the oven, although I have never done it. My best guess would be to either broil on high for about 5-6 minutes per side, or to bake really hot, like 450, for about the same time, whichever cooking method you are more comfortable with. You'll love them!